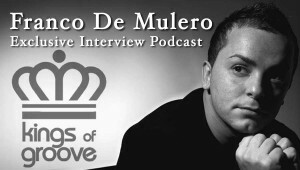 The team at House Music Podcasts were lucky enough to speak to Franco De Mulero and to ask him a few questions about his Dj Career! With his Kings Of Groove Record Label and his famous Ibiza status everyone knows Franco on the white island. Franco De Mulero, is today known as one of Ibiza hardest working DJs on the international scene, and so when someone like this comes along it’s right that the world sits up and listens. He’s a Spanish blessed with such talent that keeping up to speed with what he does is a task in itself. De Mulero has spent the majority of his earlier youth grafting, spinning records in his Native country of the balearic island (Ibiza & Mallorca ) and cutting tracks and it enabled Franco De Mulero to step out into the world of HOUSE MUSIC. His abilities in the studio are endless, some immaculate material that has slotted into an absolute cross section of fellow DJS. The Kings Of Groove & KOG Electronic records imprint now stands as one of the most forward-thinking and exciting labels in Spain, with top flight acts eagerly hanging on for news of new releases and remix work. Franco De Mulero production talents have been called upon by the great and the good over the past few years collaborate with major music labels such as Purple music, Soulfuric, Defected, Eye Industries, Universal to name a few – the names says it all. Next came an invitation for Franco De Mulero to remix I believe in you, a single from the world famous Artists Full Intention ( Michael Gray & Jon Pearn ) and also the legendary Lenny Fontana. Franco De Mulero now joins a select group of producers to work with for hes own labels. Add to all the above Last year saw Franco De Mulero busy schedule to complete an exhaustive World-Wide DJ tour. 199 gigs in different countries as well as establishing rammed DJ diary, including his 5 years residency at world-famous Clubs El Divino Ibiza, countless festivals and headline gigs around the world, and it’s clear that this is man who has conquered his game, plans to stay there for a long time to come. His passion for music is evident; the quality of his sound is undisputed. Watch out for Franco De Mulero!!! 01. How did you first get into DJing? I star in the island of Mallorca went I was 14th years old. 02. What was the first record you bought? 03. What have you been up to so far this year? Working hard like always, travelling a lot, making music, then my resident at El Divino in Ibiza & Mallorca. 04. How did you get your foot in the door? 05. What’s the best memory you have from behind the decks? Playing with David guetta in Dubai or with Louie Vega back to back in Colombia or in Austria. 06. Longest ever DJ set? 07. What’s your set-up like at home? 08. What advice do you have for any up and coming DJs? Keep working in what you love and things will come to you. 09. Would you agree that you have to produce tracks now to get a name? Not I don´t agree. This days with internet and working hard you can reach to anyone and show your talent. 11. Who is your idle in the DJ world? 13. What format do you prefer to use CDJ’s, Vinyl or Computers? Also why? 15. Who would you most like to play back 2 back with? I think there is a lot going on, there is a lot of good music and various styles which is great. 18. What is the best club you have played or your favourite club? 19. In your opinion, who is the best DJ in the world? I don´t have a best Dj in the world, nobody is perfect and everyone make mistake, I had see many Dj´s in Ibiza and sometimes they was good and sometimes they was very bad, as I say everyone got a bad nite too. 20. What do you do in your spare time? Gym, cinema, and going out with my friends for a few beers. 21. What are your plans for the next 12 months ? Keep doing what I love wich is making music and playmusic.